Removing the skin adnexa, or adnexectomy, is a procedure that attempts to remove the skin appendages, such as sweat glands, for conditions such as excessive sweating (hyperhidrosis), malodor (bromhidrosis or osmidrosis), or hidradenitis suppurativa. The goal of the surgery is to reduce these problems long term while minimizing unwanted side effects and complications. Multiple methods to remove the sweat glands in the axillary region have been described. For more information regarding the treatment of hidradenitis suppurativa, refer to the Medscape Drugs & Diseases topic Surgery for Hidradenitis Suppurativa. Individuals with hyperhidrosis may frequently have a family history positive for the diagnosis. Two main types of sweat glands are recognized: eccrine sweat glands and apocrine sweat glands (see image below). Both apocrine and eccrine sweat glands are present in the skin of the axilla. Eccrine sweat glands are the primary producers of sweat and are located diffusely throughout the skin of the body, with the highest concentrations of glands found in the axilla, palms, and soles of the feet. Eccrine sweat glands secrete sweat through pores located on epidermal ridges and empty directly to the skin surface. Apocrine sweat glands are a subset of glands located in the axilla and genital regions that become active during puberty, under the influence of androgen hormones. Apocrine glands secrete sweat into the follicular canal of their associated hair follicles. These glands secrete fluid that is thought to cause offensive odor, which is termed osmidrosis or bromhidrosis when excessive. In white patients, either all or nearly all eccrine and apocrine sweat glands are not found in the dermis layer in the skin itself but rather within the subcutaneous tissue itself or at the interface of the subcutaneous tissue and the dermis. The anatomic location of the sweat glands themselves provides the basis for the various surgical procedures available for the treatment of hyperhidrosis and osmidrosis. Although no absolute contraindications to axillary adnexectomy are recognized, several relative contraindications may exist. A thorough attempt at nonsurgical management of hyperhidrosis or bromhidrosis should be tried prior to considering surgical treatment. Patients must also understand the risk of recurrence even after surgical intervention; treatment may have to be repeated or continued. Patients who have had prior surgical procedures in the axilla, such as sentinel lymph node biopsy or axillary lymph node dissection, may be at a higher risk for developing lymphedema, or painful swelling in the arm. These patients may be at risk for lymphedema with subsequent procedures in the axilla. Before any invasive methods are used, patients should first attempt treatment with easily obtainable over-the-counter antiperspirant or deodorant products. If these products prove inefficacious, stronger clinical strength formulas may be tried as well aluminum chloride products available by prescription. Treatment with topical antiperspirants are only temporary of course, with the duration of treatment lasting at most 2-3 days, and frequent reapplication is necessary. Amir M, Arish A, Weinstein Y, Pfeffer M, Levy Y. Impairment in quality of life among patients seeking surgery for hyperhidrosis (excessive sweating): preliminary results. Isr J Psychiatry Relat Sci. 2000. 37(1):25-31. [Medline]. Sammons JE, Khachemoune A. Axillary hyperhidrosis: a focused review. J Dermatolog Treat. 2017 Nov. 28(7):582-90. [Medline]. Strutton DR, Kowalski JW, Glaser DA, Stang PE. US prevalence of hyperhidrosis and impact on individuals with axillary hyperhidrosis: results from a national survey. J Am Acad Dermatol. 2004 Aug. 51(2):241-8. [Medline]. Park YJ, Shin MS. What is the best method for treating osmidrosis?. Ann Plast Surg. 2001 Sep. 47(3):303-9. [Medline]. Qian JG, Wang XJ. Effectiveness and complications of subdermal excision of apocrine glands in 206 cases with axillary osmidrosis. J Plast Reconstr Aesthet Surg. 2010 Jun. 63(6):1003-7. [Medline]. Liu Q, Zhou Q, Song Y, Yang S, Zheng J, Ding Z. Surgical subcision as a cost-effective and minimally invasive treatment for axillary osmidrosis. J Cosmet Dermatol. 2010 Mar. 9(1):44-9. [Medline]. Homma K, Maeda K, Ezoe K, Fujita T, Mutou Y. Razor-assisted treatment of axillary osmidrosis. Plast Reconstr Surg. 2000 Mar. 105(3):1031-3. [Medline]. Morioka D, Ohkubo F, Amikura Y. Clinical features of axillary osmidrosis: a retrospective chart review of 723 Japanese patients. J Dermatol. 2013 May. 40(5):384-8. [Medline]. Nyamekye IK. Current therapeutic options for treating primary hyperhidrosis. Eur J Vasc Endovasc Surg. 2004 Jun. 27(6):571-6. [Medline]. Stolman LP. Treatment of hyperhidrosis. J Drugs Dermatol. 2003 Oct. 2(5):521-7. [Medline]. Beer GM, Baumuller S, Zech N, et al. Immunohistochemical differentiation and localization analysis of sweat glands in the adult human axilla. Plast Reconstr Surg. 2006 May. 117(6):2043-9. [Medline]. [Guideline] Hornberger J, Grimes K, Naumann M, et al. Recognition, diagnosis, and treatment of primary focal hyperhidrosis. J Am Acad Dermatol. 2004 Aug. 51(2):274-86. [Medline]. Gee S, Yamauchi PS. Nonsurgical management of hyperhidrosis. Thorac Surg Clin. 2008 May. 18(2):141-55. [Medline]. Bajaj V, Langtry JA. Use of oral glycopyrronium bromide in hyperhidrosis. Br J Dermatol. 2007 Jul. 157(1):118-21. [Medline]. Basciani M, Di Rienzo F, Bizzarrini M, Zanchi M, Copetti M, Intiso D. Efficacy of botulinum toxin type B for the treatment of primary palmar hyperhidrosis: a prospective, open, single-blind, multi-centre study. Arch Dermatol Res. 2014 Jul. 306(5):497-503. [Medline]. Mirkovic SE, Rystedt A, Balling M, Swartling C. Hyperhidrosis substantially reduces quality of life in children: a retrospective study describing symptoms, consequences and treatment with botulinum toxin. Acta Derm Venereol. 2018 Jan 12. 98(1):103-7. [Medline]. Vergilis-Kalner IJ. Same-patient prospective comparison of Botox versus Dysport for the treatment of primary axillary hyperhidrosis and review of literature. J Drugs Dermatol. 2011 Sep. 10(9):1013-5. [Medline]. He J, Wang T, Dong J. Effectiveness of botulinum toxin A injection for the treatment of secondary axillary bromhidrosis. J Plast Reconstr Aesthet Surg. 2017 Nov. 70(11):1641-5. [Medline]. Vadeboncoeur S, Richer V, Nantel-Battista M, Benohanian A. Treatment of palmar hyperhidrosis with needle injection versus low-pressure needle-free jet injection of onabotulinumtoxinA: an open-label prospective study. Dermatol Surg. 2017 Feb. 43(2):264-9. [Medline]. Cervantes J, Perper M, Eber AE, Fertig RM, Tsatalis JP, Nouri K. Laser treatment of primary axillary hyperhidrosis: a review of the literature. Lasers Med Sci. 2018 Jan 11. [Medline]. Nasir A, Bissonnette R, Maari C, et al. A phase 2a randomized controlled study to evaluate the pharmacokinetic, safety, tolerability and clinical effect of topically applied Umeclidinium in subjects with primary axillary hyperhidrosis. J Eur Acad Dermatol Venereol. 2018 Jan. 32(1):145-51. [Medline]. Nguyen NV, Gralla J, Abbott J, Bruckner AL. Oxybutynin 3% gel for the treatment of primary focal hyperhidrosis in adolescents and young adults. Pediatr Dermatol. 2018 Jan 15. [Medline]. Artzi O, Loizides C, Zur E, Sprecher E. Topical oxybutynin 10% gel for the treatment of primary focal hyperhidrosis: a randomized double-blind placebo-controlled split area study. Acta Derm Venereol. 2017 Oct 2. 97(9):1120-4. [Medline]. Elalfy K, Emile S, Elfeki H, Elmetwally A, Farag M, Gado W. Sequential extended thoracoscopic sympathicotomy for palmo-axillo-plantar hyperhidrosis. Ann Thorac Surg. 2017 Oct. 104(4):1200-7. [Medline]. Brock M, Frangakis C, Georgiades CS. CT-guided, percutaneous ethanol sympatholysis for primary hyperhidrosis. Cardiovasc Intervent Radiol. 2018 Mar. 41(3):477-82. [Medline]. Heidemann E, Licht PB. A comparative study of thoracoscopic sympathicotomy versus local surgical treatment for axillary hyperhidrosis. Ann Thorac Surg. Jan 2013. 95(1):264-8. [Medline]. Larson DL. Definitive diagnosis and management of axillary hyperhidrosis: the VapoMeter and suction-assisted arthroscopic shaving. Aesthet Surg J. 2011 Jul. 31(5):552-9. [Medline]. Chern E, Yau D, Chuang FC, Wu WM. Arthroscopic shaver with refinement for axillary osmidrosis. Int J Dermatol. 2010 Jul. 49(7):813-7. [Medline]. Kim SW, Choi IK, Lee JH, et al. Treatment of axillary osmidrosis with the use of Versajet. J Plast Reconstr Aesthet Surg. May 2013. 66(5):125-8. [Medline]. Kim HG. A new osmidrosis procedure, the scrape and suction technique: review of 4,322 patients. Aesthetic Plast Surg. 2014 Apr. 38(2):282-7. [Medline]. Ding Z, Zheng J. 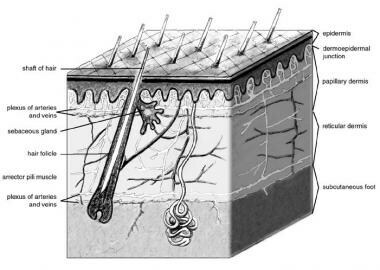 A comparison of two different sub-dermal trimming techniques for the treatment of axillary osmidrosis. J Plast Reconstr Aesthet Surg. 2013 Nov. 66(11):1569-74. [Medline]. The hair bearing skin of the patient's axilla is marked in preparation for surgery. Local anesthetic of 0.5% lidocaine with 1/200,000 epinephrine using a 25-G or smaller needle should be injected superficially in the subcutaneous tissue to create elevation of the dermis. The entire hair-bearing area of skin in the axilla should be injected and can be done prior to sterile surgical preparation and draping of the site. After anesthetic administration and preparation of the axilla, a 1-cm incision is made in the anterior axillary fold at the marked site. The arthroscopic shaver is a powered device consisting of 2 concentric cannulas on which the exposed inner cannula rotates at a rate of 900 rpm in an oscillating motion, debriding the flap of its subcutaneous tissue and sweat glands. The device has suction applied that simultaneously removes the debrided tissue from the area. The exposed inner cannula rotates at a rate of 900 rpm in an oscillating motion, debriding the flap of its subcutaneous tissue and sweat glands. The oscillating tip of the device is held up against the underside of the skin flap and away from the underlying deeper tissues. With skin traction applied, the tip is placed at the edge of the dissected plane and slowly brought back toward the incision, maintaining contact with the skin flap. Acknowledgments The author would like to thank David Larson, MD, for his instruction and expertise in the surgical management of axillary hyperhidrosis and the arthroscopic shaving technique.